The most glaring inconsistency you will ever see, as you walk around any shipyard, is the sight of high-tech grand prix racing yachts with smooth bottoms, eliptical keels, fancy low-drag propellers, and a zinc anywhere on the shaft from the strut to the hull, and a two or three inch gap between the strut and the prop. A Martec Bullet Nosed Zinc should be fitted to the shaft precisely leaving a ( 3/8" to 1/4" ) gap between it and the strut to let water thru the strut bearing. The prop should be fitted behind the strut the same way. So instead of three non-streamlined lumps dragging thru the water, you produce one smooth shape including prop, strut, and zinc. When this is not properly done the benefit of any low drag propeller will be severely compromised. All that effort and expense for the ultimate low drag bottom is voided by a poorly placed non-streamlined zinc and a dislocated prop. Martec Sacrificial Anode Zincs are available for shaft diameters from 3/4" to 1-1/2". They are made of pure zinc for the best electrolysis protection. 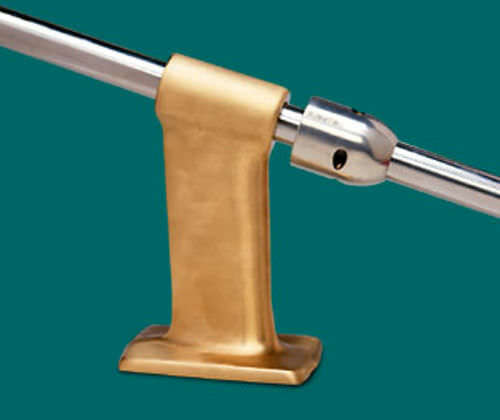 The bullet-nosed style should be used for all exposed shaft and strut installations, and should be installed as described above. Martec zinc sacrificial anodes insure your prop and shaft against electrolysis while minimizing drag and resistance through the water.